in observance of yet another year of scouting in Guyana. 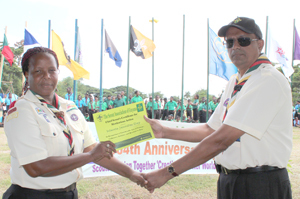 Guyana, which was the first Caribbean jurisdiction to start scouting, the second in South America and the fifth in the world, has had a scout association for 105 years. 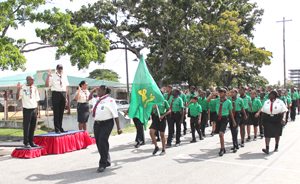 District Commissioner and Camp Chief Charissa Rampersaud, yesterday told Kaieteur News that the national camp attracted 14 scouting groups from across Guyana; some coming from as far as Berbice and Linden. Villages like Buxton, Fort Wellington and Agricola were also represented in the mix. Those representatives amounted to some 350 campers. The camp started Friday evening and will end today with an award ceremony. Yesterday’s activities began with an early morning route march. The starting point was the Association’s Headquarters on Woolford Avenue. The troops marched east along Woolford Avenue onto Station Street then North along Railway Road. They then turned east onto Sandy Babb Street then marched North onto Middleton Street and continued by turning west onto Thomas Street. The march was spontaneously dedicated to Marcia Jennifer Dey, Assistant District Commissioner with responsibility for cub scouts after the Association received news that she died a few hours before the march begun. Salutes during the route march. and to scouting across Guyana. He noted that her hands-on approach and dedication to the scout movement contributed significantly to its growth and development. Reflecting on her passing SAG’s Chief Commissioner, Zaida Joaquin said Dey was not only a scout, but a sister, friend and mother. Dey, she said, was very active in the movement and led contingents to a number of Caribbean events. She was a member of the association for well over a decade. Scout leader, Hosni Campbell told Kaieteur News that Dey trained him since he entered the Guyana Scout Association as a cub. He described her as a wonderfully unique individual who was very effective in her methods of passing on scouting principles. According to Rampersaud, the camp is supposed to be a fun experience and an occasion that facilitates group interaction and the making of new friendships. She said one of the scout missions is to impart scouts with the necessary skills for life so as to have them empowered and become well rounded individuals and productive citizens to foster a better world. On the camping ground scouts cooked for themselves and played games including water bucket relay, cricket, pass the ball and tug of war. 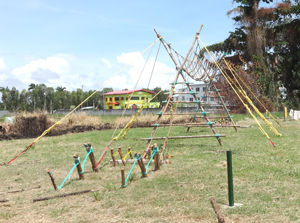 In addition to tents, they also erected a “monkey bridge” and a tower, both of which were built with only rope and wood. These according to Rampersaud are called pioneering projects. She said that two special features that were added were the “crazy socks” theme which saw campers wearing all sorts of funny socks with slippers while the campfire portrayed a 70’s 80’s theme. This morning the campers visited the St. George’s Cathedral, an activity which has replaced the usual interfaith service that is dubbed ‘scouts own.’ This Rampersaud said, is done so that scouts can develop a sense of respect for various religions while holding on to their own beliefs. Also scheduled for today is a scavenger hunt which will take campers off camping grounds. The activity to wrap up what is supposed to be a fun weekend would be the closing and award ceremony. At that ceremony, first second and third place awards would be given to the best uniformed groups from yesterday’s route march. Each group leader is also mandated to pick the best scout for them to be awarded. This year the Association will be honoring long-serving members and those who have made sterling contributions to the growth and development of scouting in Guyana. The scout movement is the oldest and largest youth movement in the world. While Guyana was among the first to have a scout group, membership had a down time because of Guyana National Service but in recent years, membership picked up again. Rampersaud said that the Association is welcoming persons who may want to join to move the organization from strength to strength.